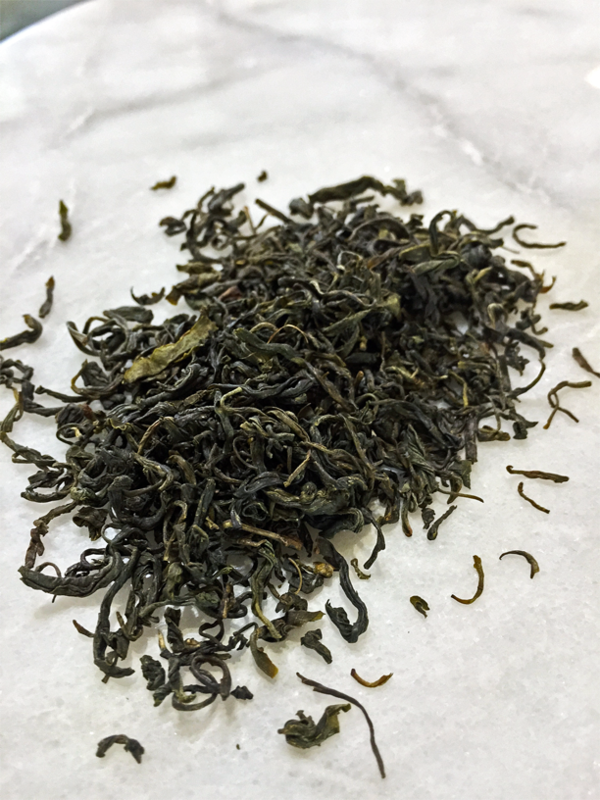 Yunwu Xiang Special Grade ~ Fujian Tea Import & Export Co., Ltd. There are seriously so many kinds of Green tea in China that if I somehow had access to every single one, and drank one a day, it would take something like 27 years to sample them all. Today I’m trying a tea for which i have no idea who the importer is. I found it at the Hua Xing Asian Foods Market in Ypsi. Fortunately the canister gives me quite a lot of useful info. According to the surprisingly legible translation, Yunwu Xiang is 100% organic Green Special Grade, Executive Standard QFJCY003, quarantine hygiene license 3500/04082 from Fujian Tea Import & Export Co., Ltd. – 11/12F., FortuneBldg., 168 Hudong Road, Fuzhou China. Yes, it was critically important that you know all that. This high-astringency Chun Mee/Bilouchun-lookalike brews to a lovely yellow-green tone with several splotchy particles clinging to the surface despite having brewed with a really fine filter (funny how the canister offers all this seemingly believable evidence that their product is organic). A highly vegetal chlorophyllic aroma with a hint of bamboo and juniper entices the nostrils. A good deal thinner than many Chinese Greens, it nevertheless has a distinctly Chinese tea grit. In flavor, I do get a very real sense of the organic, toned down quality of the leaf. Rather malty for a Green (with a creepy looking liquor): an aftertaste of something-akin to lime minus the citrus tickles the senses. I’ve decided not to rate this one since it doesn’t really fit well into the schema of other teas I usually review. Yunwu Canister by Jocilyn Mors is licensed under a Creative Commons Attribution 4.0 International License. Yunwu Loose Leaf by Jocilyn Mors is licensed under a Creative Commons Attribution 4.0 International License. Yunwu Spent by Jocilyn Mors is licensed under a Creative Commons Attribution 4.0 International License. Yunwu Liquor by Jocilyn Mors is licensed under a Creative Commons Attribution 4.0 International License.